The Mexican Red Cross is a non-governmental humanitarian assistance organization affiliated with the International Federation of Red Cross and Red Crescent Societies to help those in dangerous situations, such as natural disasters, as well as providing human health services. The Mexican Red Cross has committed itself to the national goal of saving more than 60,000 lives, preventing 110,000 disabilities and three million hospitalizations caused by road accidents. 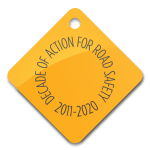 Hundreds of national and international ministers, chief executives and representatives of civil society and the private sector have gathered in Mexico City to launch the Decade of Action for Road Safety and the Second Ibero- American and Caribbean Forum on Road Safety (EISEVI 2). Meanwhile, young people and other volunteers of the Mexican Red Cross are implementing a range of activities in 180 cities across the country, including the collection of 100,000 signatures of people committing themselves to taking more care on the roads. The high rate of road crashes poses a serious public health problem in our country and disproportionally affects our children and youth. The most affected group is at the same time our strongest means to curb the disastrous trend – our youth and volunteers will remain the key to saving lives and contributing to national road safety prevention targets.